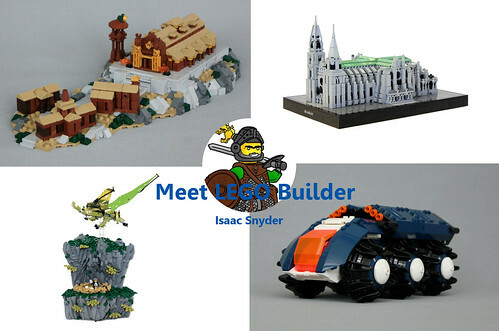 From castles to spaceships, dragons to cathedrals, LEGO builder Isaac Snyder, also known as soccerkid6 or soccersnyderi on Flickr, has spent years building creations of all styles and sizes. We recently got a chance to ask him a few questions about what LEGO building means to him! When did you first start building with LEGO bricks? 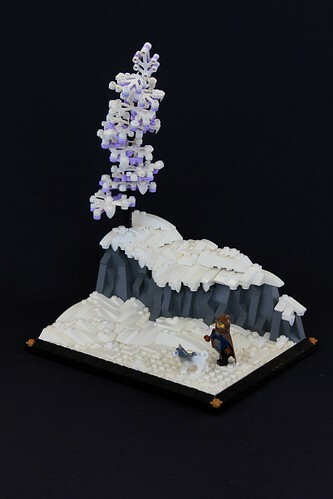 What took you from using LEGO as a toy to creating your own artistic models? I started out pretty young, couldn’t give an exact age, but LEGO was a popular toy with my older siblings and I got my own sets early. We also had a good amount of Duplo that I built with before moving onto LEGO. Growing up, LEGO was one of our most used toys and I played a lot with my next oldest brother and two younger brothers. From trucks, giant robots, rescue vehicles and boats, to medieval battles we got a lot of fun out of the versatility of these little bricks. 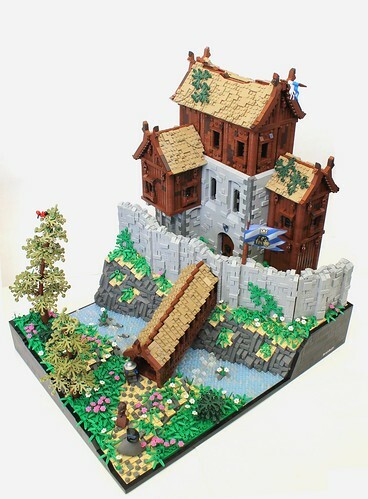 We continued playing with LEGO up to our early teen years, often role-playing games or the like, and then in 2011 I came across classic-castle.com while looking up real castles online. Seeing what other people were building with LEGO blew me away, and I started working on more serious model building right away. 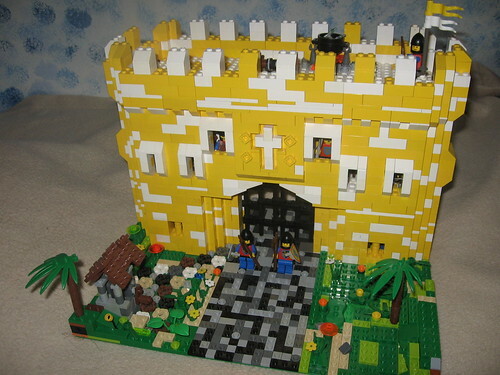 Our collection had very little bley or dark bley however, so my first castles were bright colors like yellow, white, blue, red, and black. 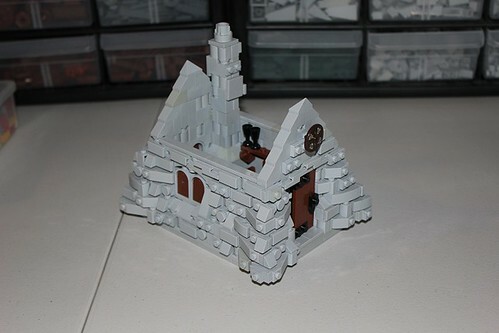 My first MOC posted in the online community was a yellow and white gatehouse, complete with interior even then! My plan at the time was to make a large castle layout in white and yellow, based off of the book Castle by David Macaulay. Which would have required an enormous amount of brick, so I ended up never completing the project. What do you most enjoy about building? Hard to say, I guess it’s the combination of relaxation and challenge that it offers. Creating your own original buildings, vehicles, and landscapes without having to worry about using glue, paint, or knives and scissors like traditional model making is a lot of fun. And it never ceases to amaze me how such a large number of people can all create such unique and original builds when everyone has the same parts library to work with (theoretically :D ). 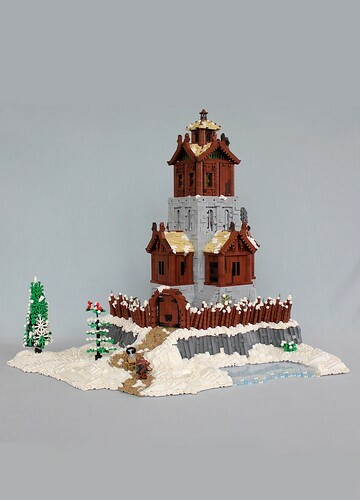 What subjects or themes are your favorites to recreate in bricks? The obvious answer is anything in the Castle theme. Besides my medieval models, I enjoy making replicas of real buildings, various sci-fi vehicles and landscapes due to the unlimited possibilities, and modern day settings. I would like to make several larger than minifig scale modern interiors in the future. At this point though, I don’t think there’s anything I’ve tried building that I’ve disliked. It’s just the question of time to build everything! The LEGO pallet keeps expanding year after year what is your favorite color? Very difficult question, I use bley the most, probably. Though there are a lot of beautiful colors I like a lot, but just don’t have enough of to use regularly. Dark blue and dark green are always nice. Orange is another color I like a lot but doesn’t usually end up being the best choice for my medieval models. 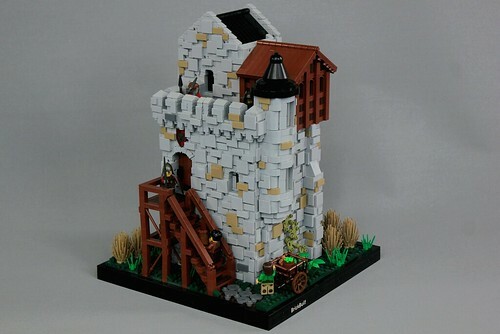 About how long would you say it usually takes you to build a medium-sized MOC? There’s a lot of variation, due to how much free time I happen to have then, or how motivated I am to work on a project. I would say in the 3 to 12 day range. It is rare for a project to take me more than two weeks unless it is large. Then there are another couple days added for photographing and editing pictures. Could you share with us some special techniques you find yourself using over and over? John and I have a running joke that we rarely use the same designs twice, often developing a complex technique for use in a specific build and then never using that design again. Though there are some tricks I use often. I like to incorporate interiors into my builds quite often, and so have come up with three main ways to do this: hinges for opening buildings, removable rooms, open backs. Flex tubing or bar trees are super simple and are one of the few tree designs I don’t mess up, so I use them a lot. What is the greatest challenge of the MOCing process for you? This isn’t always the case, but often the most difficult part is very early on in the build process, after I have the idea, but am just trying to bring that idea to life in bricks. There’s always the question of which area of the build to start on, or what techniques will work to give me the desired style. After I have the first chunk of the build done, things tend to get easier as I then have a precedent to work off. Roofs are another consistent challenge as I make my buildings first and then must design roofs to fit the building. Which sometimes is challenging to achieve, especially with more complex roof shapes. Can you give us a description of your usual building process? Do you typically start with a concept in your head, something cool you’ve seen somewhere, a tablescrap you built, a new technique, or what? Which part of a build comes first the landscape or the building? At what point do you decide on the minifigures and the backstory of the build? It’s rather unusual for me to base a build off a table-scrap. Sometimes I get an idea for a technique that I think would be really cool and will then make a build to test out my theory and see if it actually works. 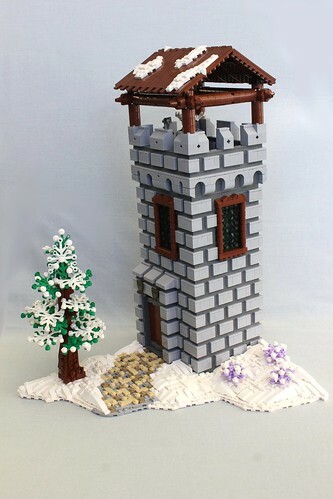 An example of this would be my Elken Watchtower. More often I have an overall concept in mind that I want to build. A small castle with landscape for instance. Then I might look at real examples of castles, or MOCs by other builders to get a feel for what sort of look I’m excited about creating. Over the last two years I’ve also started doing a lot more builds based on source material. In which case I’ll start by finding as many good pictures of what I’m replicating as possible, and then go from there. As for what portion of the build I start with, it varies from creation to creation. If the model will have a building, I like to establish the footprint of said building first. That way I get a good idea of the overall model size, and how big a landscape will need to be. Whether I actually build the landscape or building first depends on the complexity of each. If it’s a very involved landscape, I’ll often build that first being sure to leave a spot for the building. Or if the landscape is something simple, I’ll make the building first and then build scenery to go under it. And if the two are closely related, I may even build them both together to get the smoothest fit. Usually when I’m beginning a build I’ll have a good idea of the basic story or purpose I need to achieve with the scene. Minifigures tend to be one of the last things added. Of all the creations you’ve built so far, which is your favorite? What motivated you to build that particular creation? How long did it take you? What makes it so special? Ultimately, I think my best build isn’t exclusively mine! That is, it was a collaborative effort with my brother John. 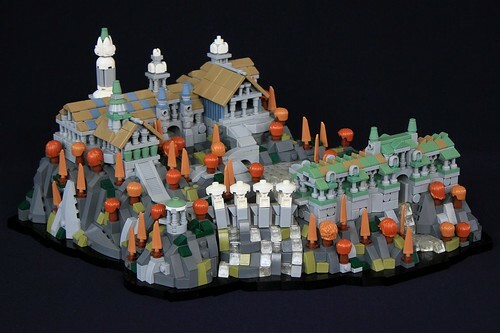 We built Life in Nordheim in 2016 to take to Brickfair Virginia. The previous year we had done a large scale collab set in Kaliphlin (John’s guild in Guilds of Historica), so it seemed only fair to do a large scale collab set in Mitgardia (my guild). I can’t remember exactly how long it took to build, but I believe it was a bit over a month. It is still far and away the largest model we have ever built. Whenever I look back at it, I’m surprised by how well it all came together. Working at such a large scale can be really challenging composition wise, but everything just worked out so well. There’s so much to see in the scene, even full interiors in all the buildings! Someday we will likely build something bigger and better, but probably not anytime soon. Especially since I don’t believe we’ve done anything even half as large over the last two years. 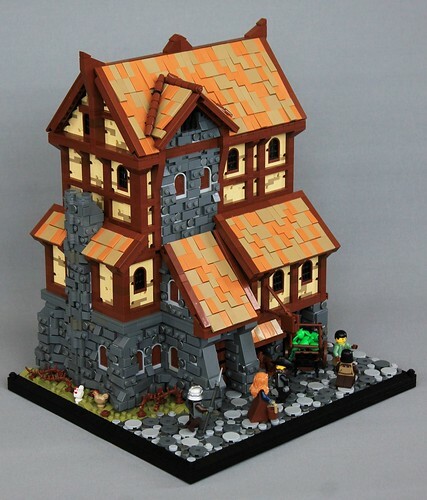 One of my favorites of your creations is Sigurd’s General Store, along with your other Skyrim inspired MOCs! What prompted you to build Skyrim MOCs and what made you pick this particular building? Was it helpful to have a definite inspiration, or was it limiting or both? I’ve played a bit of Skyrim myself, and found a lot the architecture and landscapes to be stunning. And seeing some magnificent Elder Scrolls builds by Thorsten Bonsch inspired me to try a few myself. Sigurd’s General Store is based off of Bits and Pieces which is the general store in the city of Solitude. Solitude has a lot of particularly impressive stone buildings, and I knew I wanted to build something from there. After looking around at several buildings, I thought that Bits and Pieces was a good one to try as it had plenty of interesting features but wasn’t too big. Working off source material is a help and hindrance at the same time. You don’t have to make a lot of the design choices where windows go, how big the various building sections are, etc., but you do have to try and figure out how to accurately capture the subject. The most difficult portions of this build were incorporating hinges to allow for easy interior access, and the dormer roofline. Once in a while I post a build that I’m proud of and expect to be popular, but instead it seems to get very little love. Does one of your creations stand out to you as fitting that description? I think that’s something that happens to every builder. Harburg Castle is one of my larger castles, and I was super pleased with how it turned out, but it’s not anywhere near my most popular build, with lots of smaller simpler models receiving more recognition. In this case I think it was mainly due to the photography not showing off the model to full benefit. 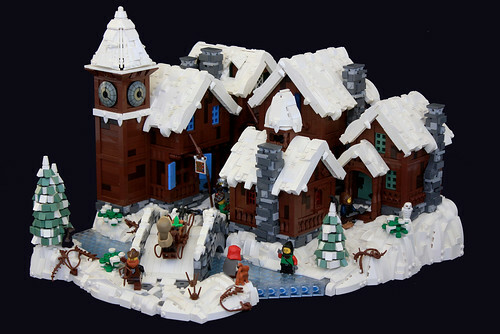 A white background makes the snow just about invisible, while the dark background gives less contrast for the castle, especially the roofs. 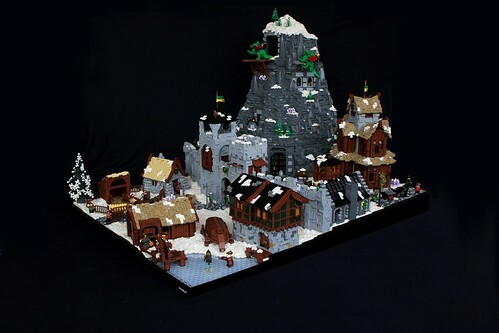 What’s one of your favorite builds by another builder? Why do you appreciate it so much? Over the years I’ve seen thousands of inspiring MOCs by other builders, and the one I like most at any given time is usually related to what I’m trying to build myself. 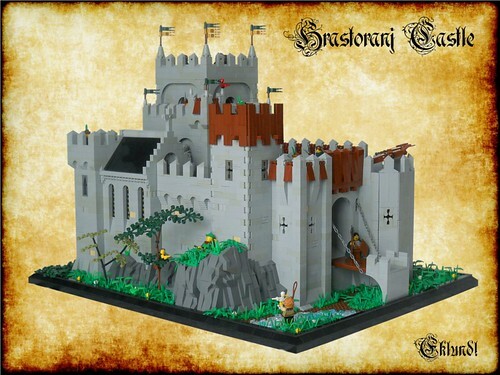 Hrastoranj Castle by Tommy M.
It illustrates some of my favorite things about the castle theme: impressive overall composition; plenty of detail, but subtly incorporated; viewable from all sides with each different angle showing something new; and lovely architectural patterns. Contests can be great for providing inspiration and incentive to try new themes and styles, but they can also be limiting and frustrating. I know you’ve participated in dozens of contests why do they appeal to you? I appreciate the straightforward build prompts they provide, and even more so the camaraderie and fun to be had by participating. As a young builder in the community, I used to eagerly enter loads of different contests, and very rarely get anywhere near winning. Rather than discouraging me, it pushed me to try and build better myself. Nowadays I usually enter contests if I’m particularly inspired by the theme, or as a way of showing my support for various forums or groups. And it is fun having a large portion of the LEGO community all focused on building stuff for the same contest. Gives you a chance to see how uniquely each person approaches a build subject. And it can help you build relationships with other builders. Not only have you participated in contests, you’ve also judged and hosted contests! Tell us a little bit about that side of the competitive arena! I’m sure it’s lots of work, but what does it feel like to see people take your categories and build prompts and turn them into brick? Hosting contests does indeed take plenty of work! Though it’s all worth it if you can inspire and motivate builders to make creations they otherwise would not have built. And recruiting a team of people to help with administration both lightens your workload and helps make the contest the best it can be. Running the Summer Joust over the past three years has been super rewarding for John and me, and we certainly plan on hosting plenty more contests in the future! I would encourage people to enter quite a few contests themselves before hosting any, as it gives you a good idea of what sort of organization you would like your own contest to have. And people are much more likely to enter your contests if you’ve been part of the LEGO community for a while. Another great aspect of the LEGO hobby is the chance to collaborate with other builders. I know you’ve done this both virtually and in person what collabs that you’ve participated in have stood out to you as the best? What do you enjoy most about collaborating with other builders? Collaborative efforts are one of the best things about being involved in the LEGO community. It allows you to achieve projects you could never do alone, and more importantly interact and engage with loads of other LEGO fans. As for stand out collabs, there are plenty I’m proud of. The Blizzard for Guilds of Historica was loads of fun, and was one of the first collabs I was involved in. If I recall correctly, you organized the Wonders of Historica project that seems ages ago now, and it produced some lovely builds. All of our InnovaLUG FlashMOCs and convention collaboratives: Isles of Aura Flash MOC, Age of Empires, Ye Old Merry Battleground, and Isles of Aura BW 2018. 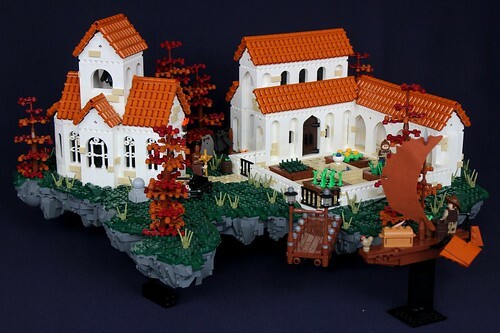 The Age of Empires Flash MOC was especially cool, as it was such a simple concept: recreating buildings from Age of Empires. And the community enjoyed it hugely, easily recognizing the various buildings we had built. Speaking of collaborating with other builders, you’ve got a great opportunity to do that with your own brother! What’s it like having a younger brother who rivals your building skill? Friendly competition, iron sharpening iron? What happens if you both need the same piece? Having a brother who is also a LEGO fan has been one of the main reasons I’ve stayed so involved with the community. Building together is way more fun than building alone, and its super helpful to have a second opinion and approach so readily accessible. But our collection is large enough that needing to use the exact same piece is rare, and we can always adjust our plans some and use a different color or element if needed. Any conflicts that used to come up were simply handled by my being older and bigger. Now that ‘bigger’ is quite a tossup between us, we use mostly diplomatic approaches. Have you developed “real life” friendships through the LEGO hobby? How has mutual interest in LEGO helped you to connect with other fans you meet? Absolutely! The first thing that comes to mind is my relationship with John. While obviously we’ve been brothers much longer than we’ve been in the LEGO community, he is 6 years younger than me, and we weren’t particularly close until we started sharing the LEGO hobby. In recent years we’ve been blessed to build relationships with other builders through the two LUGs we are a part of (InnovaLUG and RochLUG), as well as the various forums and contests we participate in. Discord has been very helpful in allowing us to stay in touch with other builders easily if you’re reading this and have a discord account, send us a flickermail with your user id and we’ll chat sometime! Of course a great place to meet other LEGO fans is at a LEGO convention how many conventions have you been able to attend? What do you enjoy most about them? Any standout experiences of particularly exciting events? I have been to two LEGO conventions: Brickfair Virginia 2016 and Brickworld Chicago 2018. Both were loads of fun and allowed us to meet tons of amazing LEGO builders in person. Brickworld this year was amazing, as it seemed throughout our time there we were constantly talking with different builders and just being able to hang out with people from all over the world. Some intense games of Nerf with the InnovaLUG crew will certainly be remembered for years to come. And playing ultimate frisbee and soccer with a large group from the convention was super cool! Besides LEGO building, do you have any other hobbies that you’d like to tell us about? Are you able to tie this in with your LEGO hobby at times? As my username indicates, I greatly enjoy playing soccer. I started playing in a league at four or five years old, and while I’m not part of an organized team anymore, I still enjoy pick up games and playing around with my brothers whenever possible. Reading is another of my interests, fiction and non-fiction. I now have a pretty good collection of books on castles and medieval buildings which are fun to look through for inspiration and ideas. I also enjoy playing card games and board games with friends and family. What field are you working/studying/want to study in? Has your experience creating LEGO builds influenced your choice of job or career? Do you think it has helped you/will help you advance in your field of choice? I recently graduated with an Associate’s degree in Interior Design. My interest in LEGO helped steer me towards a design curriculum and I was even able to use LEGO on some college assignments. Any project that did involve LEGO always got a great grade too! What do your family and friends think about your LEGO hobby? Do they always have this sort of grin on when they tell other people about it? (Mine do.) Are you cool but a little weird or just cool? I’ve certainly gained a reputation as a LEGO guy, even in college it didn’t take long for my classmates and professors to notice my interest in the brick. After seeing what I’ve built and realizing each model is entirely original, the reception has always been positive. My family is quite supportive, especially after seeing various opportunities come about through my involvement with the LEGO community. Thanks for sharing so much of your LEGO hobby with us, Isaac! Keep bricking!